Online grocery shopping is now available. Sign up Today for exclusive early offers! 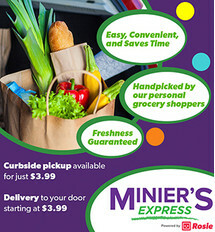 Now you can shop online at Minier’s and have your groceries prepared for curbside pickup or delivery. Each order is carefully hand-picked by our in-store experts, and we offer a 100% happiness guarantee on every single order. Shop online in minutes for all your favorite foods, and we'll have it ready for you at a time of your choosing, and guaranteed fresh! Minier’s Express is powered by Rosie, our online shopping partner. To get started, click the button on the right to create a free account on Rosie, and then start shopping our complete inventory for all your favorite items. At checkout, choose from available days & times for home delivery or in-store pickup. You can also download the Rosie App right to your phone! · Curbside pickup is available from 10am - 7pm, Monday – Saturday. · Delivery is available from 10:30-11:30am and 5-7pm Monday-Friday; and 1-3pm Saturday & Sunday. · Pricing: Curbside Pickup is just $3.99. Delivery starts at $3.99. All sales and advertised discounts are available online. Other item prices will vary online from in-store. All prices will be reflected on the order screen before you place your order. Visit us at https://www.facebook.com/MiniersSupermarket and let us know your thoughts. You can also email us questions or concerns at http://www.miniers.com/contact.